DUMBARTON will start the second leg of the Ladbrokes Championship Play-off final with a 1-0 lead over Alloa Athletic. 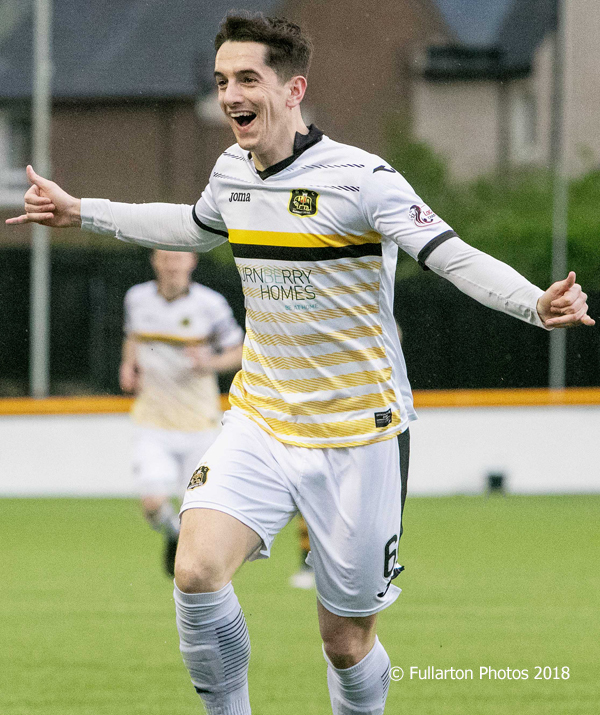 DUMBARTON will start the second leg of the Ladbrokes Championship Play-off final with a 1-0 lead over Alloa Athletic after a hard fought victory at the Indodrill Stadium. In front of a good crowd on a dark and wet night in Alloa, a magnificent goal gave them a priceless victory in the first leg. With only six minutes gone, Stuart Carswell (pictured celebrating) scored only his second senior goal with a searing 25-yard drive after controlling Danny Handling's pass. As expected, the Wasps, with five former Sons players in their team, made it tough, and they could have levelled only minutes later, but ex-Son Jordan Kirkpatrick struck a post. The second half was equally evenly contested, with Kevin Nisbet missing narrowly for Dumbarton while only a fantastic tackle by Craig Barr denied Calum Smith six yards out. Subs Liam Burt and Mark Stewart also came close before the final whistle.